What's going on, you might well ask? Well, having gotten sick of soldering on board No.2, I thought I would progress board No.1 a bit. Which involves... soldering! Actually, I had to fabricate the cross board track from board No.1 to the fiddle yard and then wire in electrical feeds for both ends. Having done that, I thought that titivating the trackwork would be a good idea! The odd soldered bits were painted a base brown; the majority having been sprayed the same. I then proceeded to drybrush a lighter cream/brown/grey mix onto the sleepers. Ultimately I will go back and add some brighter rust bits and an overall wash, but for now this will be sufficient painting. 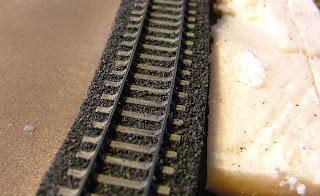 I used a similar process to Edward; spreading glue in and around the sleepers and then adding the ballast. I am using Woodland Scenics which I think is sufficiently fine and more importantlyto me, is of a consistent grade. This is a piece of single track which is actually on a double trackbed; the line was singled very early in its life. I did consider laying a double track bed and ballasting the whole. However, careful inspection of the Marsden Rail DVD "Harrogate & District" clearly shows that the unused portion has been deballasted, lies substantially lower than the remaining track, and is quite overgrown with grass and smaller shrubs. 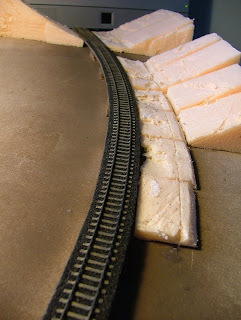 As such, I will make this part of the scenic element and plaster to the track base at a slightly lower height. Having done about 50% of the ballasting on this board, I will continue and then complete the scenic contours in insulation board. Then comes the plaster!